This bird was so delicious and moist. Cooked in a Weber. 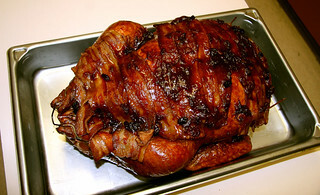 Wrapped with bacon. Stuffed with apples and onions. There were two of these beauties. The guy who cooked this drives a big VacCon truck; he maintains and clears out stuck storm drains.